Tavern Naša Priča is located in downtown at No 44 Dalmatinska Street. Beautiful modern interior is what separates tavern Naša Priča from other traditionally decorated taverns that for many years make this city authentic. This new young tavern in a heart of Belgrade offers unforgettable party until early in the morning. During winter season 2013/2014 tavern Naša Priča has prepared many music surprises and we believe that many gusest of this tavern will write their own stories they will gladly remember in future. Tavern Naša Priča has pleasant ambient with great ventilation, so you can forget about stuffiness and sing your favorite song as loud as you can. Guests at tavern Naša Priča are a bit older. In tavern Naša Priča prices are very affordable, so without worrying about your wallet you can enjoy in great atmosphere and fun that this tavern guarantees. Tavern Naša Priča has won many hearts of fans of night life that they were expecting eagerly. Those who have experienced and heard about tavern Naša Priča, always return. Specific spirit of tavern Naša Priča is exactly what makes it special, along with tradition of low prices and very cozy ambient. Extremely interesting music program of remarkable quality and always a good atmosphere make tavern Naša Priča one of most popular places in town. Music genre is oriented trough pop and folk and depending on mood of guests music changes, so you can here anything. For your bohemian pleasure tavern Naša Priča is currently opened two days a week from 10 pm to 3 am. Reservations are mandatory because of great popularity of this tavern. Friday and Saturday are reserved for best party in town and very soon you can expect for this tavern to work more than two days. 10 meters from tavern Naša Priča there is a big parking space for 220 vehicles that has video surveillance, so you don't have to worry. 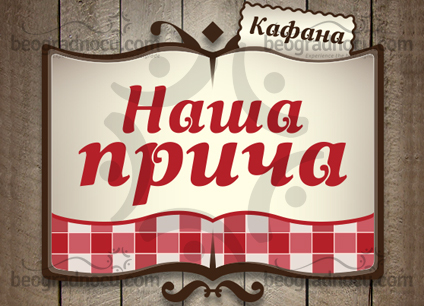 Just come and start your own story that you would like to tell every day only in tavern Naša Priča.